As you know, some churches have been around for centuries and others have just been established a couple of years ago. Regardless of the number of years a church has been present, it is important to celebrate an important milestone such as an anniversary. Celebrating such an amazing event will help remind people that their faith has led them to a lifelong mission of dedication and commitment to the life the Lord has made for them. In relation to this, a program will serve as a guide the people on the sequence and schedule of activities for such a hectic and amazing celebration. 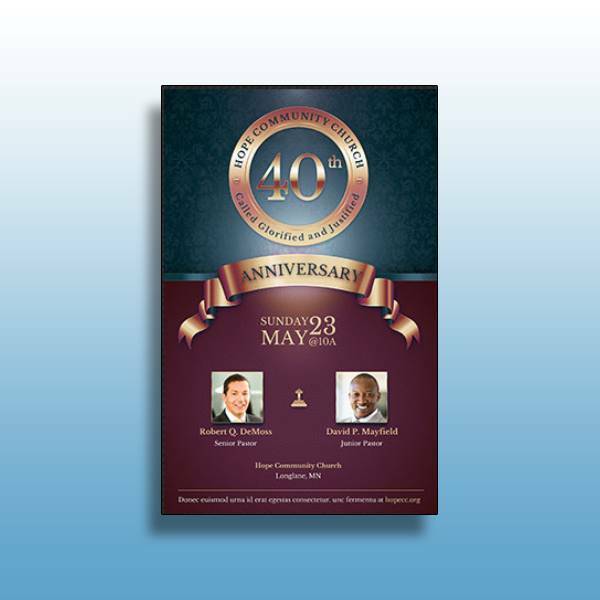 An anniversary program needs to have all the necessary information relating to the event such as the number of years for the founding anniversary, the name of the event, date and time, location or venue, and so on. The program should also have the official church logo, if applicable, to tie it all to the identity of the church. 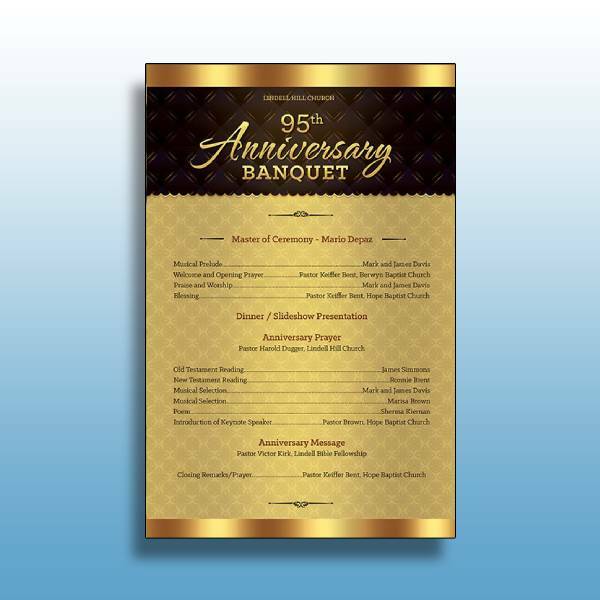 If you are looking for an anniversary program that you can use as a guide, this example perfectly shows the balance between the designs and text elements that you should be mindful about. Since a program is basically a guide that tells the readers about the correct sequence of activities that will be done during the anniversary celebration, it is important to list everything down as clearly and as accurate as possible. Ensuring that the correct sequence of activities are listed will help achieve a smooth flow of the entire event. With that in mind, you should choose the right font size and format to help make the program templates easy to comprehend. A program can have different formats; the most commonly used format, however, is a bifold format. However, if you are planning to print and distribute quite a few numbers of programs, it is best to think of a cost-effective option. 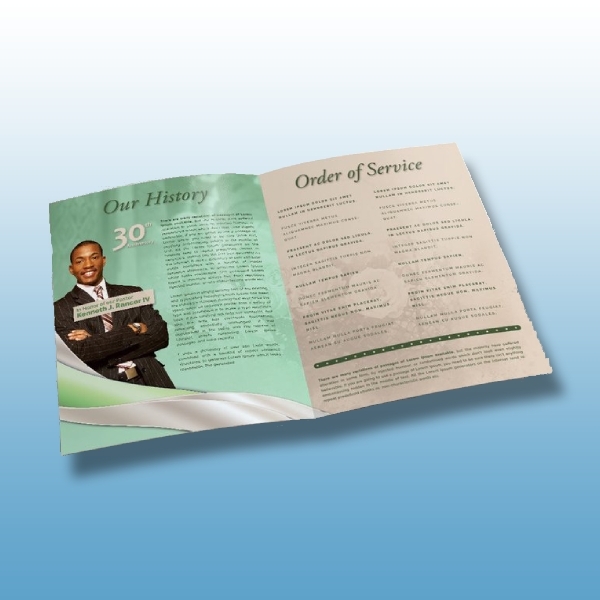 Using a single-page program will still allow you to create a beautiful program cover on the front and the sequence of activities on the back. Before a person can become a pastor, he or she must first meet the requirements set forth by the rules and policies of their congregation. Aside from the church itself, the pastor can also celebrate an anniversary of his or her ordainment. Celebrating this milestone should be participated by the whole congregation, thus, may have quite a few activities lined up. To help make sure that everyone is aware of the sequence of activities, a program should be given to the members and attendees. 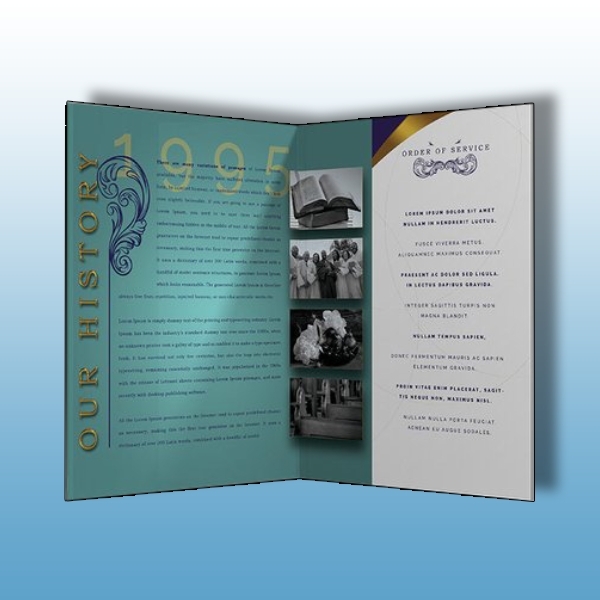 Having a bifold format program will allow you to include as many necessary details as possible. This format will allow you to include all the necessary images that will help document that progress of the church along with the necessary context to help look back from where the church stated. In the same sense, you can also list down the correct order of the activities along with a brief description to help readers understand what will happen and what its purpose is. 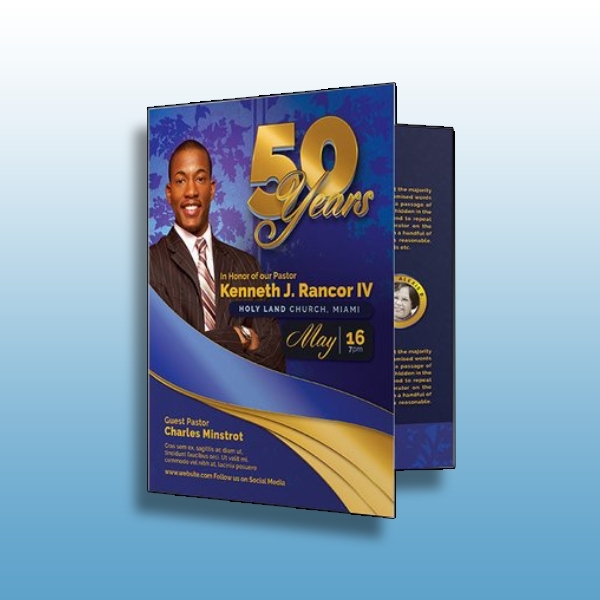 A simple church anniversary program will still allow you to present all the necessary information about the event. It only means that you are to use a simple layout and illustration to help better emphasize the details and information that you like the people to know. A simple layout means that you stick to the basic design elements like the church logo, simple borders, clear layout, and so on. Doing this in the program that you give to your church members and other attendees will help them easily comprehend the text elements. 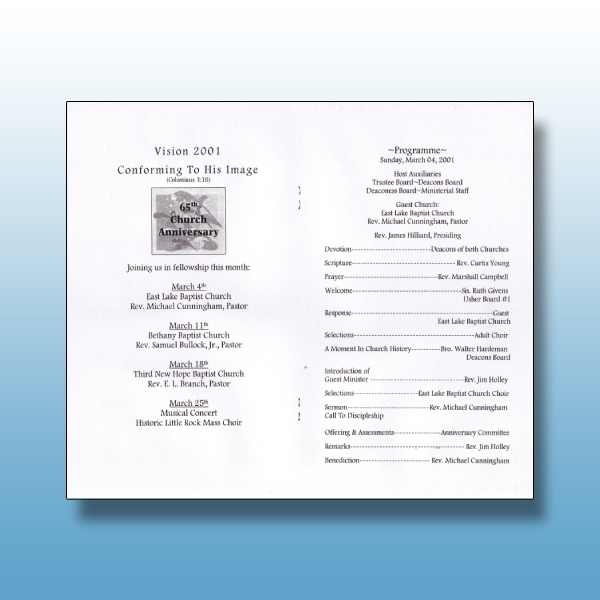 In this example, you can clearly see how the program of events is chronologically listed. The time for each activity is listed to help people become aware of how time during the celebration will be spent. Moreover, this program has also used different and somewhat contrasting design elements which makes it appear messy. Thus, it is important to avoid doing, so just focus on giving the people a sense of direction through prioritizing the sequence of events in your program. Sometimes, you just need something simple and easy. In this case, this example has nothing but texts relevant to the church anniversary celebration. It may seem boring and plain, but it has successfully presented the sequence of activities clearly and comprehensively. The purpose of giving the readers a guide on the flow of the event has been successfully executed by this straightforward program through its clear format and layout. If you want to achieve this effect and outcome, you can use this example as your guide as you set the layout and format your program. 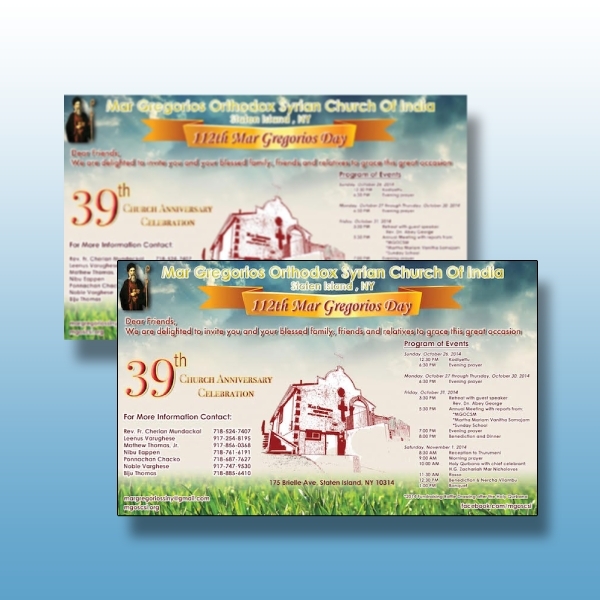 Contrary to the previous example, this church anniversary program example has a sort of complicated format. Its contents or sequence of activities cannot be easily comprehended because of a messy and overcrowded format. 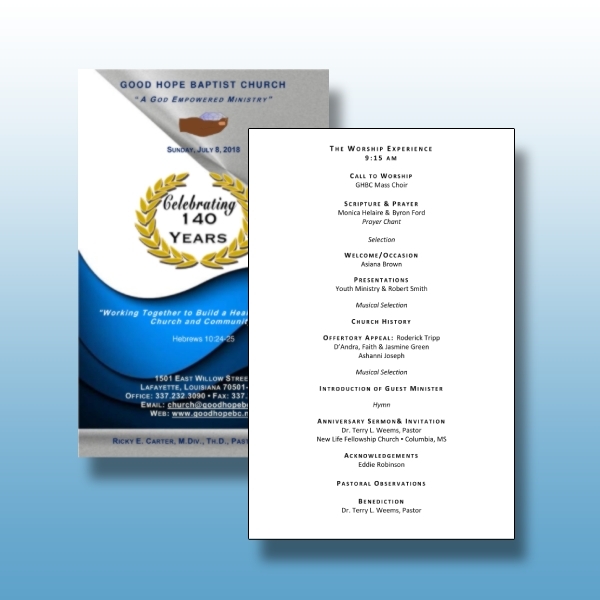 If you are to create a church anniversary program, it is best to make sure there is an indicator or line that separates each part of the program so that texts do not get mixed up with each other or use a better font style. 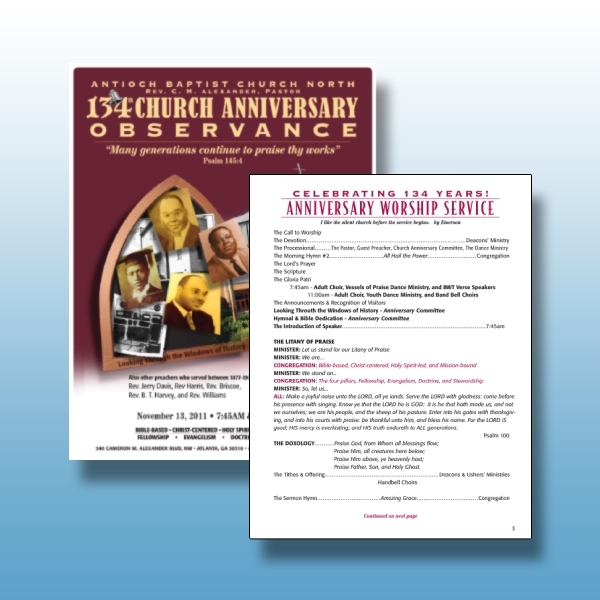 Make sure that your members and invited guests easily understand the contents of your church anniversary program with the help of a clear and simple layout. There is simply no need to complicate things, so long as you are able to provide the right heading and the corresponding activities under it along with the person in charge then you’re good to go. Take a look at this example, the cover also has a simple layout and design, and the program itself has a clear and straightforward layout. Take inspiration with this example to achieve a well-curated program. With such a hectic and activities-filled event, it is important to provide the attendees with a program that they can refer to when they want to know what activities they want to attend. 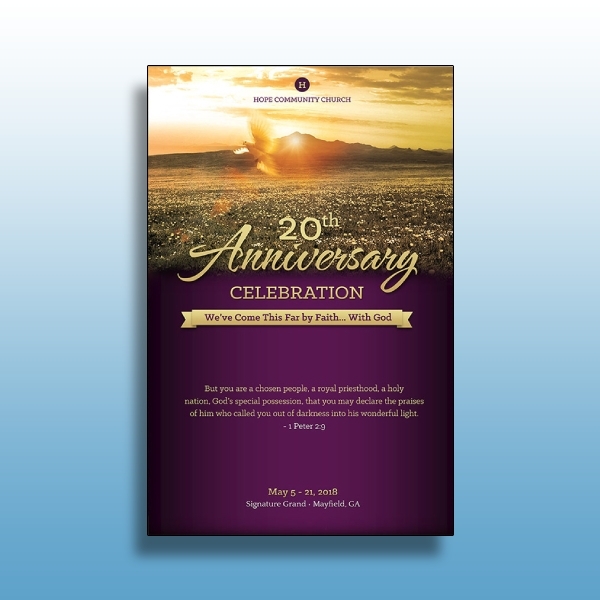 We hope we have given you new sources of inspiration with the church anniversary program examples we have included in this article.